Tonight in Iowa City, two of the best women’s basketball players in the nation will face off at Carver Hawkeye Arena. 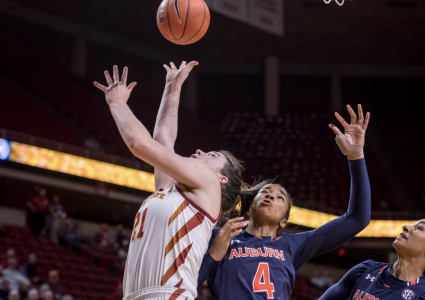 Bridget Carleton and the Iowa State Cyclones are set to play their second road game of the season against Megan Gustafson and No. 16 Iowa. The pair of players were both unanimous all-conference selections along with being named to the Wooden Award Watch List before the season started. Gustafson has had a career start to the season at Iowa. In seven games, the senior is shooting 77 percent from the field and averaging 24.9 points per game for the Hawkeyes. Fennelly called her numbers staggering. Carleton on the other hand, leads the Cyclones with 17.1 points per game on the year while shooting at a 39.4 percent clip. When the teams take court on Wednesday for another chapter of the Cy-Hawk rivalry, all eyes will be on them. Though, Fennelly said that that doesn’t mean that’s who will win the game for either team. That’s the message that Fennelly has delivered to his team this week leading up to the game. In recent memory in Iowa City, it hasn’t been the Cyclones making a lot of the plays. Iowa State hasn’t secured a victory on the road against their rivals since the 2006 squad walked away with a 80-74 win. 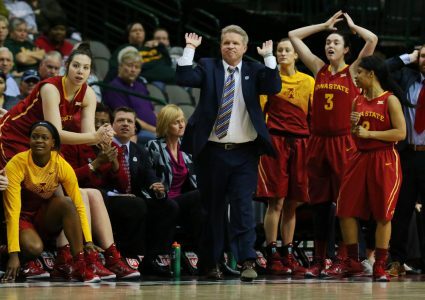 Not to mention, under Fennelly on the road in the Cy-Hawk series, Iowa State has a 3-8 record. Aside from Carleton and Gustafson, however, there are a few different players that could make an impact for the Cyclones. One of which might be under the spotlight as much as the two all-American contenders are. 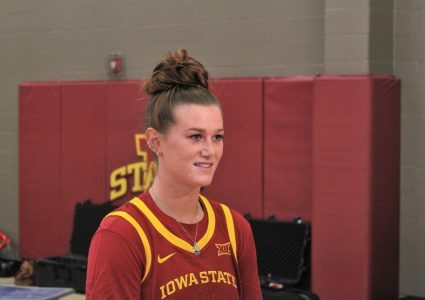 Iowa State freshman, Ashley Joens, is a native of Iowa City and the highest rated recruit of all time to play for the Cyclones. Through seven games, Joens has played 29 minutes per game and is scoring 11.1 points per. She shouldn’t need any help staying calm. Joens credits her calm mentality to growing up with her sisters. She said when you grow up with them, she didn’t really talk much [on the court], she just had to go out and compete. Another pair of players are coming off of their best games in Iowa State uniforms in Alexa Middleton and Kristin Scott. The two scored 15 and 21 points, respectively, in the team’s 91-82 win over Arkansas. Middleton – a transfer from Tennessee – was recovering from a knee injury over the summer and hadn’t been conditioned to play as long as some of Iowa State’s starters. Though it seems like her play is ramping up. On the other side of things, right now, Kristin Scott is the sharp shooter coming off of the bench for Iowa State. Currently shooting at a team high 58 percent clip, Scott has been instrumental to Iowa State’s 6-1 start to the season. Along with Scott, Iowa State’s two other post players will be ready to come in and show they have what it takes to tame Iowa and Gustafson. 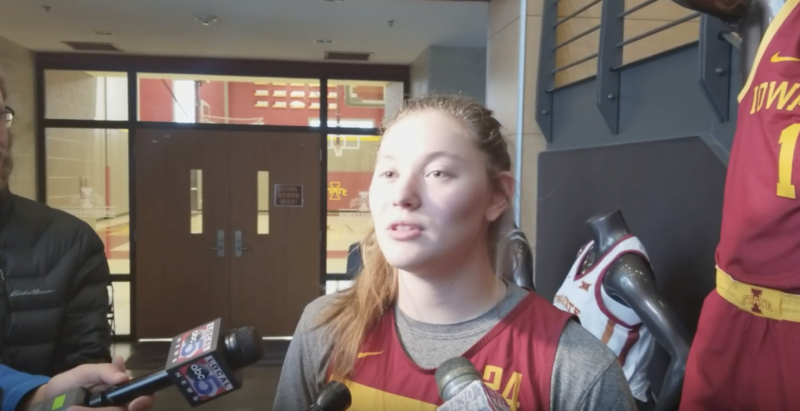 Like they have in each game this season, Fennelly will roll with Scott and senior Inéz Nezerwa coming off of the bench with Urbandale native Meredith Burkhall starting at the post. Fennelly said all three of them will play in the first quarter on Wednesday – something else he’s done each game this season – and see which of them has the hot hand. Fennelly said that role includes his post players needing to try and draw [a foul] against a lot of post players that Iowa State is playing against. He said if they get a draw or even close to it, that’s going to help the team. Iowa State currently trails in the Iowa Corn Cy-Hawk Series standings 7-6 with wins in women’s soccer and both men’s & women’s cross country. Iowa gained its wins in football, volleyball, and most recently wrestling. The two teams will tip off tonight at 7:00 p.m. at Carver Hawkeye Arena. The game will be live streamed on BTN plus. “You don’t know the play that’s going to change the game and you don’t know who’s going to make that play,” Fennelly said.